Odds are, your data was hacked in 2015. Your medical records, address, financial documents, and probably your social security number were illegally accessed by hackers looking for easy financial gain by taking advantage of security gaps in the information systems we all rely on to do – well – pretty much everything. Information systems are the world’s newest battlegrounds, and the war being waged in the virtual universe is no laughing matter. Hackers are pros, with the skill and innovation to circumvent security measures and exploit vulnerabilities. How many times have you heard about massive information leaks this year? How many people in your life have been personally affected by identity theft, stolen credit card information, or compromised personal or medical information? This is war with serious civilian and economic casualties, and businesses are working nonstop to protect their sensitive data and information networks from a smart, motivated, and unethical group of online supervillains. Fortunately, there are good guys in this battle. White-hat hackers, sometimes called white hatters, are professionals with the same skill and technique as the thieves storming our information systems. The difference? They’re armed, along with training and serious know-how, with the ethics to fight back. There’s nothing amateur about the skill and training required to work as a white hatter. Businesses are increasingly desperate for knowledgeable professionals who can help them to identify vulnerabilities and prevent the types of information leaks that make headlines every day. As a result, industry standards have become increasingly stringent, which means that white hats are now, more than ever, professionally recognized as leaders on the front lines of the information systems battlefield. The Certified Ethical Hacker certification is a professional credential obtained through the International Council of Electronic Commerce Consultants. It’s the gateway certification to fighting the good fight on the world’s massive information systems, and it requires a serious course of training. Technology is an ever-changing animal, so the CEH certification changes with it. Footprinting and Reconnaissance: Intelligence-gathering techniques hackers use to learn about the networks they target and the devices on those networks. White hatters can attack those same networks, with the goal of discovering vulnerabilities before they’re discovered by the enemy. Social engineering: Social engineering is your grandmother’s worst nightmare, and it’s a potent weapon for hackers interested in preying on the weak. Manipulating people to gain information may sound like a Cold War tactic, but it’s very much alive. Skilled white hatters root out social engineering and protect the weak. Web servers: If you’re a crook looking to steal piles of data from a business, this is your goldmine. Those businesses need white hatters to secure against vulnerabilities with constant testing. Wireless networks: Think your wireless network is secure? So do the countless victims of identity thefts. Learn to build a bulletproof network and shield users from spying eyes. Enumeration and Cryptography: Enumeration is the process of actively connecting to a network and directing queries to that network to learn more. White hatters learn to recognize and fight off this stage of the attack. If you already work in information systems, chances are you’ve had some exposure to the need for white hatters, and it probably wasn’t pretty. Businesses usually learn the hard way that fighting back after an attack means it’s too late – the enemy has already cut and run, and you’re left with empty pockets, hurt clients, or both. Preemptive strikes and defensive systems are what secure modern businesses today. If you’re a business owner or IT manager looking to step up your defenses, you need qualified personnel with an updated skill set. If you’re an employee in need of a skill refresh or you’re interested in taking your credentials to the next level, CEH may be for you. 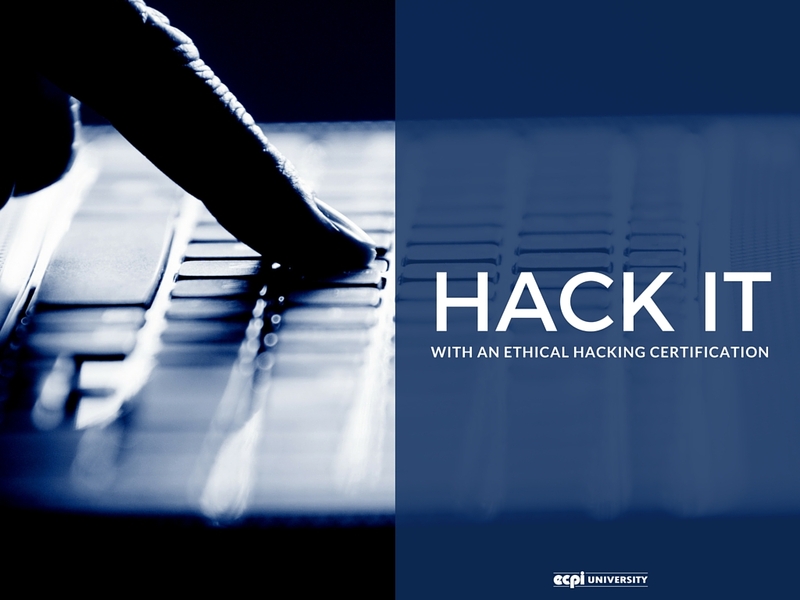 If white-hat hacking sounds like an exciting way to channel your skills and knowledge into a career as a virtual superhero, then an ethical hacking certification may be for you. Contact ECPI University today, and let’s talk about how our professional development courses can drive your career to the next level.